It’s a popular assumption that almost 60% of what we put on our body is absorbed by our skin. However, looking at recent studies it’s hard to tell just how accurate that is. What is true though, is that some products applied to our skin do eventually work their way through our skin and into our bloodstream. Think about it, if you apply a thick and nourishing night cream every night and have been doing so for many years, then the chances that some of the cream being absorbed by your skin are quite high. We should know by now that most skin care products found on our supermarket shelves are full of toxins and harmful ingredients. If not, then I suggest you read my book, Primal Cure. What’s important to understand is that when it comes to understanding how many toxins and harmful ingredients work their way into our body, that there are two different ways this can happen. You may have heard about skin penetration – this is when a chemical makes it’s way into the deeper layers of the skin. Absorption on the other hand, is when the chemical actually makes it into the bloodstream. These two terms are often mistaken for one another, but really, they couldn’t be any different. The one we need to focus on when considering skin care products is the absorption rate of these products. Every chemical found in our skin care products have a different absorption rate and to complicate things further, some chemicals react on the body and in turn increase (or decrease) the chances of that chemical becoming absorbable. For example, alcohol (ethanol) is commonly found in supermarket products and when paired with other chemicals, it’s absorption rate is massively increased because it breaks down the skins natural barriers. Scary, huh? This is exactly why I prefer to invest in natural and organic skincare – so I know exactly what’s going onto my skin and potentially, into my body. 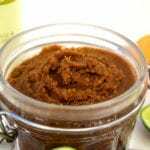 So today, my Primal friends, I bring you a homemade body scrub that’s not only more beneficial to your skin than your regular toxin filled body scrub, but it’s incredibly cheap and easy to make. Say bye bye to your expensive skincare price tags! 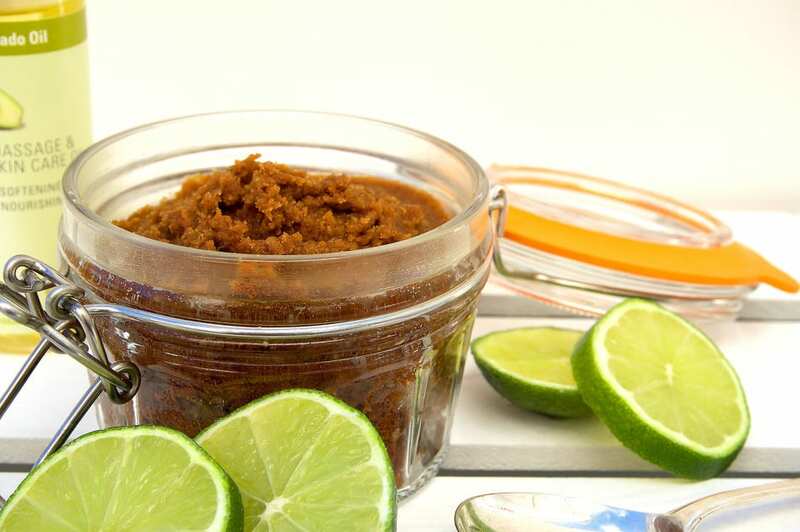 This lime and almond oil body scrub contains only 4 ingredients and can more than likely be made straight away – if you’ve got the ingredients! Now, call me a hypocrite but this recipe does indeed call for sugar. I know, I know! But let me assure you that the sugar is purely for the scrub… not for eating! The sugar really does allow that grainy texture so it is necessary. I use coconut sugar in this recipe though, simply because my kitchen doesn’t contain normal sugar – however, it’s not necessary so you can use brown sugar or coconut. Like all my homemade recipes, this one is particularly easy to tailor to your own personal preferences. I’ve used almond oil here however, if you’re not a fan of almond then why not try avocado oil? According to Dr Axe, almond oil is known for protecting the skin against UV radiation damage and helps keep skin soft, moisturised, brighter and less puffy. Almond oil is light in texture, therefore it’s easily absorbed by the skin. As well as that, it makes a fantastic lotion to remove debris, dirt and make up from the skin. It’s also high in vitamin A and suitable for sensitive skin. This body scrub is best applied to the skin when your just about to jump out of the shower. Simply apply a generous amount to your body and massage in circle motions all over – making sure to get a good scrub. Once done, simply rinse off and pat your skin dry. You’ll soon notice how soft and smooth your skin is. It’s a great exfoliator! Give it a go and let me know what you think. 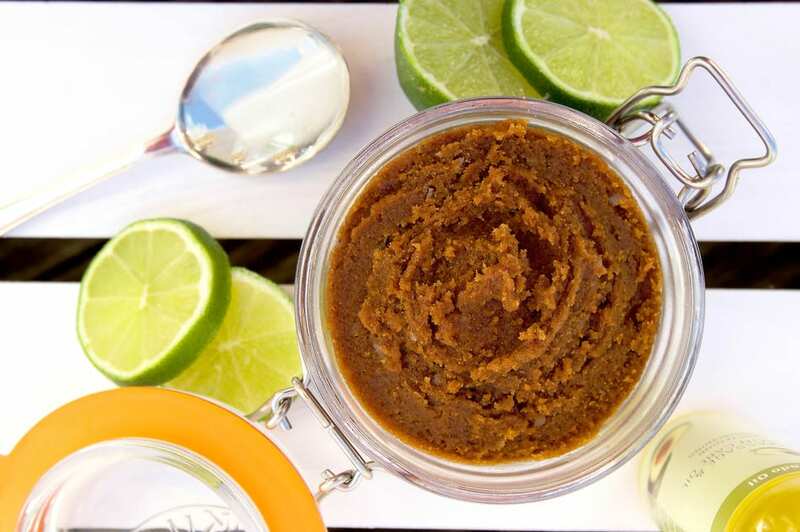 A homemade scrub that will energise and nourish your body without toxic ingredients! Add all of your ingredients to a food processor and whizz together until you reach a creamy, body scrub texture. You can add more sugar for a coarser scrub. Scoop your scrub into a sealable jar and keep for up to a week.